Deveneys of Dundrum: Sierra Nevada Celebration Ale. I really started this week on a bad footing, my form was pretty horrendous and I felt about as festive as the remains of last years Christmas tree. I had a party to rectify the Scrooge Syndrome. Mince pies, a bit of Chris De Burgh, cheese, wine, Christmas beers and liqueurs. The Sierra Celebration Ale is the pyjama beer I've been looking for...... Ideal for lounging with the Goonies and a ham and mustard sandwich. The nose is ripe fruit - peaches and melon with a little bit of cinnamon. The palate is hop, spice, fruit and very slightly piney. A touch of sweetness on the finish and really easy drinking. Roll on the 25th, bed wear and a couple of cold Sierra Celebrations teemed with some turkey sandwiches and 'The Muppet Christmas Carol'. This has definitely made it into my top 10 Christmas drinks for Dec '09. 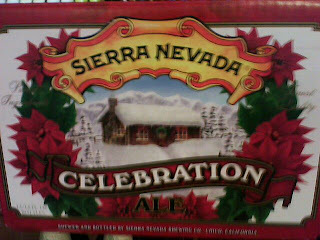 Labels: Sierra Nevada Celebration Ale.